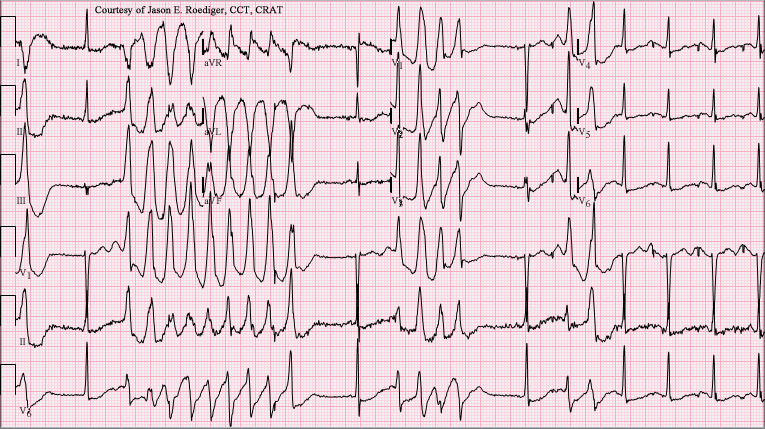 Torsades des pointes refers to a cardiac dysrhythmia (referred to as a polymorphic ventricular tachycardia). This most often occurs when a ventricular depolarization (QRS complex) is triggered when the heart is attempting to repolarize (T wave). It is for this reason that the inciting event is often termed “R-on-T phenomenon) and also explains why the ventricular tachycardia is polymorphic. This is a serious cardiac dysrhythmia that can progress to ventricular fibrillation and death. EKG/ECG: sinusoidal waveforms on EKG can be observed that are diagnostic of torsades.